Ranet OLAP pivot table sorting option includes commands for sorting data in ascending and/or descending order. Users can additionally configure sorting parameters. Sorting can be applied to a row area, column area, or data area in the pivot table. Figure 1. Ranet OLAP pivot table sorting settings. In this example, [Date]. 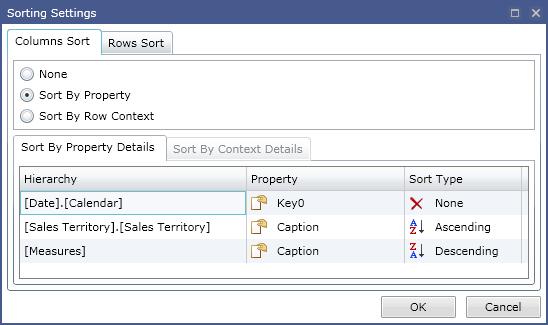 [Calendar] hierarchy columns are not sorted in the client workstation (they are displayed in the order as arranged as a result of an MDX query). Hierarchy [Sales Territory]. [ Sales Territory] is arranged in the ascending order, and hierarchy [Measures] is arranged in the descending order. Rows are arranged in the ascending order. Figure 2. Result of the sorting settings. The sorting is done on the client workstation.